Is Anesthesia Safe When You Have COPD? Are you worried about the risk of anesthesia due to chronic obstructive pulmonary disease (COPD)? The combination of COPD and anesthesia may carry a significant risk. Long-term survival rates for people with severe COPD who have surgery is often poor. There is also a significant risk of postoperative complications, especially within the lungs. But does this mean that COPD patients should never have surgery? Your established exercise tolerance, especially with climbing hills and stairs. If, and how often, you've developed exacerbations of COPD and if you've ever been hospitalized for them. If you've ever required non-invasive or mechanical ventilation to help you breathe. Your smoking history—both current and former smokers are at greater risk. If you currently have a cough and/or sputum production—both have been associated with a higher risk of post-operative complications. Any other illnesses—understanding co-existing medical conditions (comorbid conditions) is very important in identifying additional risk factors. Whether or not you have signs and symptoms of an active lung infection. Your nutritional status—patients who are both underweight and overweight are at increased risk. Chest x-ray - helps to identify current lung infections or additional problems within the lungs. EKG - helps identify heart problems that may increase the risk of surgery. Spirometry - used to both diagnose and determine the severity of COPD. Lung diffusion test - tells your doctor how well oxygen passes from your alveoli to your bloodstream. Six-minute walk test - helps to establish exercise tolerance. Arterial blood gases - helps to identify preoperative oxygen and carbon dioxide levels in the blood. Smoking cessation. Because current smokers have a much greater risk of developing post-operative lung complications from surgery, those who do smoke should quit at least eight weeks prior. If you still smoke, check out this complete guide to smoking cessation. Drug therapy optimization. Most COPD patients benefit from taking at least one dose of a nebulized bronchodilator before their operation. If you want to brush up on your treatments in this regard, or if you usually use an inhaler instead of a nebulizer, check out this step-by-step guide on how to use a nebulizer to make sure you are getting the full benefit of your treatments. In addition, if you are one of the majority and are trying to remember which medication does what for COPD, check out this information on understanding your bronchodilators. Treatment for infection and/or exacerbation. Having a lung infection or exacerbation of COPD may contraindicate anesthesia. Contraindicate is simply a fancy way of saying you can't have surgery. Signs and symptoms of active infection should be treated with antibiotics in the period prior to your operation. Chest physiotherapy. Draining mucus prior to surgery helps remove the excess, which may cause post-operative plugging or pneumonitis. Remind yourself about these five airway clearance techniques and check out this brush-up on clearing mucus with postural drainage. If at all possible, avoiding general anesthesia is optimal for decreasing risks. Talk to your doctor about possible alternatives, such as local or regional anesthesia. Studies have found that people with COPD have a lower risk of pneumonia as well as ventilator dependence if regional anesthesia is used instead of general anesthesia. Shortening the duration of surgery and the length of time you are under general anesthesia, if this is needed, may also be beneficial. We've talked about lessening risks, and you've probably heard from others that undergoing surgery with COPD is risky, but what exactly could happen? What, specifically, are those risks? Some people wish to know what could happen, but others would rather not think about it. 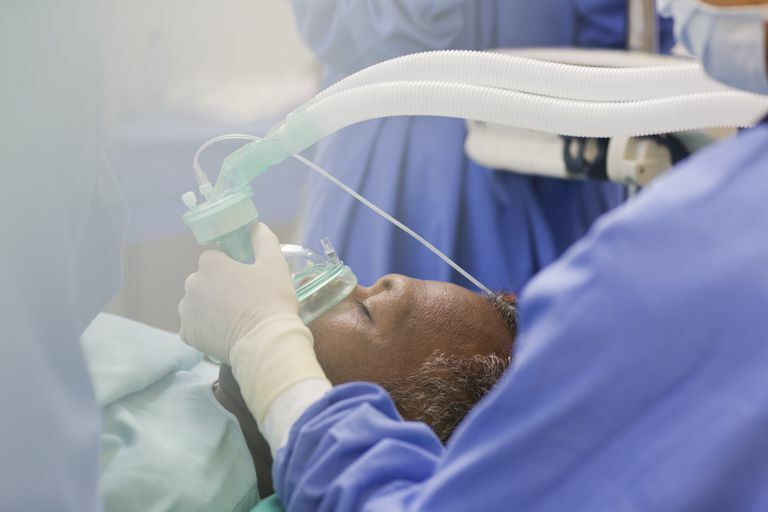 If you are someone who wishes to know, here are a few things that can occur as complications when people with COPD have surgery with general anesthesia. Inability to wean off of mechanical ventilation - For general surgery, a tube is placed into your airway to provide ventilation. A significant concern with lung disease is that the additional stress of surgery on the lungs will make you "ventilator-dependent" even if you were previously breathing OK without assistance. Hypoxia - Tissue damage and cell death due to inadequate oxygenation to the body, including the brain. Blood clots and pulmonary emboli are very common in people with COPD, especially if surgery requires that you be inactive for some time. All COPD patients are at greater risk for developing complications after surgery that involves anesthesia. Active management during each phase of surgical intervention is essential for ensuring an uncomplicated recovery. Cheng Q, Zhang J, Wang H, et al. Effect of Acute Hypercapnia on Outcomes and Predictive Risk Factors for Complications Among Patients Receiving Bronchoscopic Interventions Under General Anesthesia. PLos One. 2015. 10(7):e0130771. Hausman M, Jewell E, Engoren M. Regional Versus General Anesthesia in Surgical Patients With Chronic Obstructive Pulmonary Disease: Does Avoiding General Anesthesia Reduce the Risk of Postoperative Complications? Anesthesia and Analgesis. 2015. 120(6):1405-12. Kim H, Lee J, Park Y, et al. Impact of GOLD Groups of Chronic Obstructive Disease on Surgical Complications. International Journal of Chronic Obstructive Pulmonary Disease. 2016. 11:281-7. Kiss G, Claret A, Desbordes J, Porte H. Thoracic Epidural Anesthesia for Awake Thoracic Surgery in Severely Dyspnoeic Patients Excluded From General Anesthesia. Interactive Cardiovascular and Thoracic Surgery. 2014. 19(5):816-23. Is It Safe to Drink Alcohol When You Have COPD? Does End Stage COPD Truly Mean the End? Are You Possibly at Risk for COPD? Is Surgical Treatment for COPD Right for You?